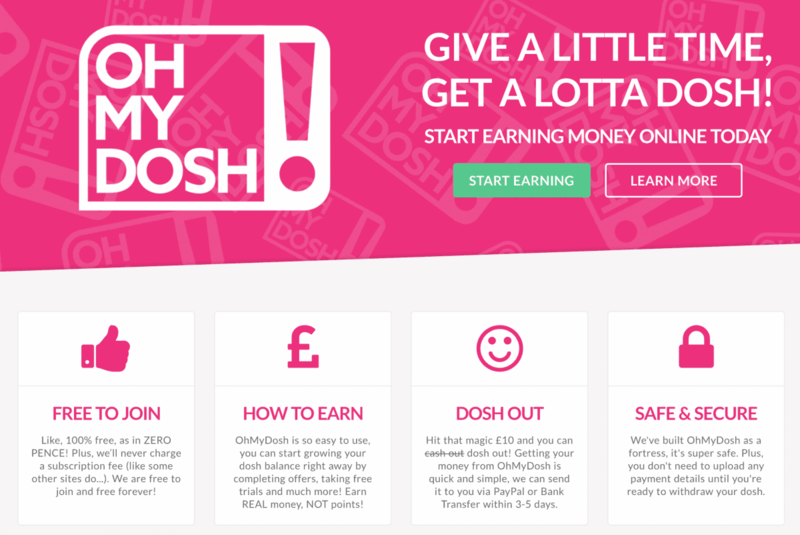 Start Earning Online with OhMyDosh! *This post is in collaboration with OhMyDosh! For years now I have written about ways to earn a little extra money online or ways to save money, get a bargain or even get something for free. My latest find that lets you do all that in one place is OhMyDosh! OhMyDosh! is a new platform where you can spend time earning money, making use of special offers and promotions and really turning that time usually spent procrastinating online into time spent more wisely – giving you extra dosh in your pocket! Signing up toOhMyDosh! is simple and free – there’s no monthly or annual fee to pay and any money you earn through the website is yours to keep – you can ‘dosh out’ as soon as you reach the £10 minimum or keep earning to have a handy savings pot to put towards Christmas or your summer holiday. When you sign up to OhMyDosh! you are met with a really fun and funky interface which is so nice to spend time on. Each of the ways to earn money are split into handy categories with Hot Offers right at the top. These are simple ways to earn money that will soon add up. 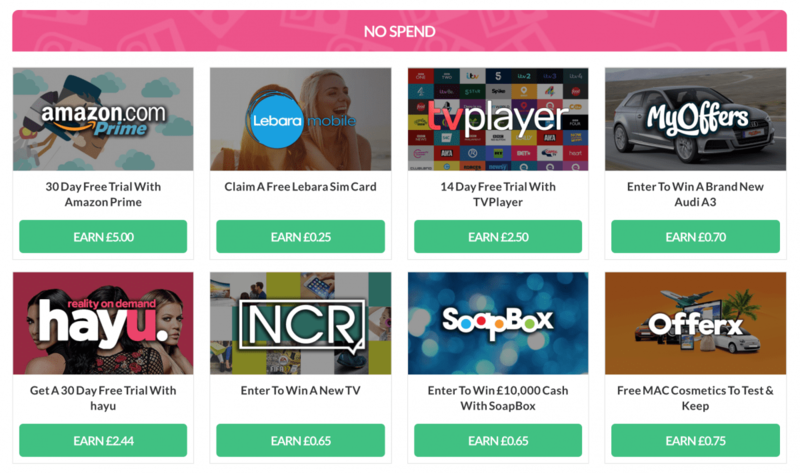 Some of the current hot offers are things like trying Now TV for 14 days – where you will earn £5 or you can sign up to a 30 day free trial of hayu to earn £2.44! It’s literally money for doing things that are free to do – money for nothing! 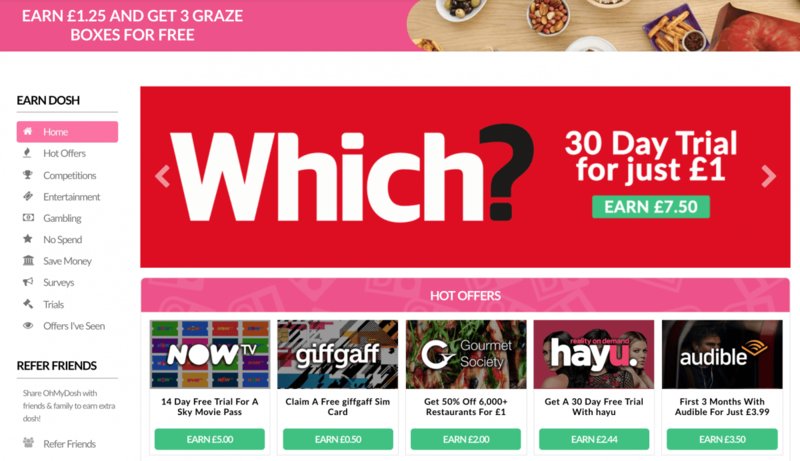 Other offers include signing up to get a free sim card and earning 50p, buying a Gourmet Society membership for just £1 – giving you 50% off so many restaurants – and earning £2 in the process. Or, you can sign up to Audible at a discounted rate of £3.99 for 3 months, earning you £3.50 – so really having Audible for just 49p for 3 months! As you can see, some of the others require you to spend money in order to earn money but most incur just a minimal cost and are probably things you would like to try anyway. 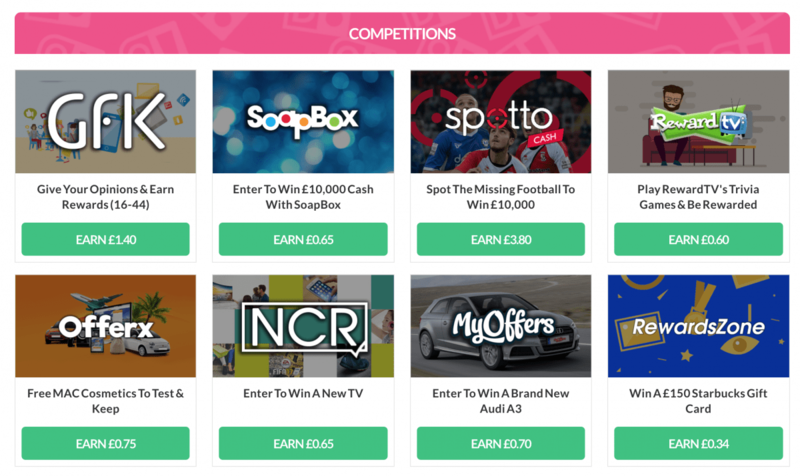 Other ways to earn money are by entering competitions – You can enter to win £10,000 cash with SoapBox, fill out a simple survey and earn 65p in the process. Now, I know 65p doesn’t sound like much but imagine if you did ten things each evening whilst watching TV. Even if you earned just £10 a week that’s an extra £520 a year just through spending a few minutes here and there online. If you want to earn money without spending a penny then OhMyDosh! has a ‘No Spend’ category that you can stick to – full of great offers that will earn you money and cost you nothing. Things like signing up for an Amazon Prime 30 day free trial and earning £5 or earning anything from pence to pounds for answering online surveys. There are also gambling sites to try your luck on and even ways to save money – and earn money at the same time! If you switch your utilities through the links on OhMyDosh! you could earn up to £20! 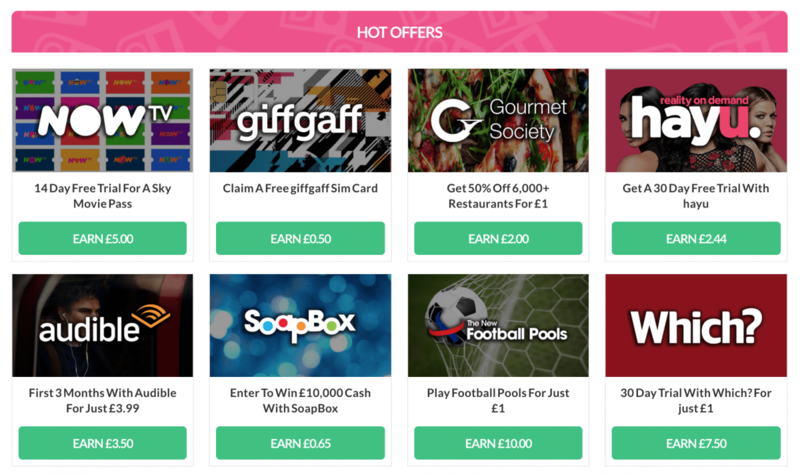 There are so many offers on OhMyDosh! that I can’t go through them all. But, I can guarantee that if you sign up you’ll be earning money in no time. Once you have clicked through the links and started earning money the transactions show as pending on your balance. Once confirmed the amount gets added to your account balance and you can ‘dosh out’ once the confirmed amount reaches £10 and payment can be made by Paypal or BACS bank transfer. Now if OhMyDosh! sounds like something you’d love to try for yourself then sign up now. Once signed up make sure you refer your friends to OhMyDosh! too – once they have earned £10 you will get a £5 bonus plus, your friend gets a £1 welcome bonus when they sign up too! So what are you waiting for – sign up now. I’ve honestly not heard of this app before! We’re in the process of going through our finances as we’d like to buy a new car in the summer. I’ve just posted about cutting our food bill in half and I think I’m going to try this too – who doesn’t love money for nothing??? Plus – every little helps.